Freedom Road Socialist Organization | May Day 2018: Build Independent Working-Class Power! May Day 2018: Build Independent Working-Class Power! May Day, the international day to celebrate the working-class movement, was born in May 1886, in Chicago, during the desperate fight for the 8-hour work-day. While both protesters and police were killed in that clash, immigrant labor organizers were convicted– without evidence–of the attack on police. Every May Day, people all over the world remember as martyrs the four who were hanged: Albert Parsons (husband of Lucy Parsons), August Spies, George Engel and Adolph Fischer. Since 2000, in U.S. cities May 1 has also become known as a day of organizing for immigrant rights. On May Day 2018, there are important signs of the U.S. labor movement’s growth and increased relevance. We see big, visible strikes, more people joining unions, and more public support for unions. Last month nearly 15,000 workers joined unions in a single week, with three-quarters of the new members under the age of 34. The “Fight for 15” has raised wages in several cities and changed the national conversation about low-wage work, although it is now coping with significant reductions in union funding. Polls show support for unions at over 60% for the first time in a decade. The West Virginia teachers’ strike sparked a national movement to resist the destruction of public education and their profession. The West Virginia teachers’ strike sparked a national movement to resist the destruction of public education and their profession. The strikers are mostly women and are women-led. They are fighting in Southern and Southwestern states where workers do not have the right even to a contract to set the terms of their labor, never mind the right to strike. We call these ‘New Confederacy’ states because they have been using Republican control of State legislatures and Governors’ offices to impose on the rest of us minority rule by reactionary, white-supremacist, free-market advocates who are also anti-woman, anti-gay and anti-union. Right now, the New Confederacy controls all the branches of government in 26 states. Austerity policies that slash public funds for education, health care and other public services that working people need are among the New Confederates’ favorite weapons. The striking West Virginia, Oklahoma, Colorado and Arizona teachers have struck a thunderous blow against austerity and the destruction of the public sector. Almost 3,000 union fighters gathered in April at the Labor Notes conference to share strategies for building progressive unions, defeating corporations, and deepening alliances with other movements. This is a significant development in building a broad labor left. An increasing number of unions have stepped up to join with Black, immigrant and youth leaders in broader fights against deportation, police violence, mass incarceration and other attacks on working people. Teachers’ unions are fighting against the school to prison pipeline and have joined the youth-led anti-gun violence protests. Teamsters in New York and Painters national union (IUPAT) have declared themselves ‘Sanctuary Unions,’ while the hotel and restaurant workers’ union UNITE-HERE has negotiated protections against deportation raids on their undocumented members. The Service Employees Union (SEIU), the Communication Workers (CWA) and some state federations have taken up the Movement4Black Lives challenge to have difficult discussions about race. We have seen hopeful signs like these before, but they have never gained the strength to reverse labor’s 50-year retreat. Most unions remain narrowly focused on defending against the full-scale attack on what was once the norm for most union members: a decent wage, affordable health care and a chance to retire with dignity before you die on the job. Since Trump’s election, the national AFL-CIO has taken a step backwards from its efforts to build alliances with other social movements and a broader social vision. It has turned back towards the old ‘Gomperism,’ a term we use from the first AFL president to mean a focus on narrow ‘core union issues’–collective bargaining or workplace issues. Some unions, like the Mineworkers, fought the Klan and supported civil rights. But the dominant U.S. labor tendency has been to look the other way and not put fighting white supremacy at the center of our struggle. The federation also still embraces police unions, which continue to circle the wagons to protect their members no matter how brutally racist their actions. As Trump launches his all-out assault on unions, and state preemptions by right-wing New Confederacy legislatures undercut progressive municipal efforts, it is abundantly clear that labor needs a new political strategy. The AFL is calling balls and strikes on Trump, as though his stance against working class people was some kind of close call! Mainstream labor’s political strategy has been trapped between a complete reliance on the Democratic Party, or a pragmatist belief in “no permanent friends and no permanent enemies,”. Some on the left offer a simplistic call for a labor party. These have all hit a dead end or been non-starters. They offer nothing to the labor movement or those socialists organizing to build it. The Democratic Party long ago deserted its pretense of being a party of the working class. Even its New Deal program is a memory. For example, Roosevelt’s Second Bill of Rights from 1944 offered a universal platform of economic rights that today’s Democratic leaders would dismiss as too radical. Bill Clinton endorsed the neo-liberal program of privatization and austerity and openly doubted that unions had any future. The national Democratic Party may be an ally on certain important issues such as defending the right of Black people to vote, but it is controlled by big money and cannot be a vehicle for working class power. Calls for a labor party fail to understand the rigid U.S. two party system and the reality of white supremacist capitalism here, which are different from Europe and demand a different form of electoral organizing. We recognize there is more than one kind of power that we seek for our people as we fight for a socialist future. We recognize there is more than one kind of power that we seek for our people as we fight for a socialist future. There is social movement, or political, power –the organized power of working class people to protest and win concessions from bosses and governments. At times we can contend for governing power: actually holding territory in the government from which we can fight for and implement policies that help our people. And there is state power, the full force of the capitalist state apparatus to control our lives, from the press and educational systems to police, courts and armed forces. Today a path to power is being created on the ground by state and local projects that are fighting for independent working-class power and answerable only to our own people. Statewide organizations like New Majority Virginia and Minnesotans for a Fair Economy, and local movements like Durham For All in North Carolina and United Working Families in Chicago, differ in many ways but share a vision of contending for power for working class and oppressed peoples. They work in the street and in the election booth. They work inside and outside the Democratic Party. They fight both austerity and white supremacy. They build on the strategic alliance of the working class of all races and languages with the movements based in communities of color. They promote honest discussions of differences that must inform shared goals and strategy. And each of these organizations includes progressive unions that have committed to this long-term work. On May Day 2018, we who work in unions are bargaining contracts, organizing new members, scrapping and clawing for our members’ every need – a pension, a fan in the heat of the summer, or a workplace without deadly carcinogens. We fight to defend the public sector – the ‘public good’–and link our movement with other movements for social change. 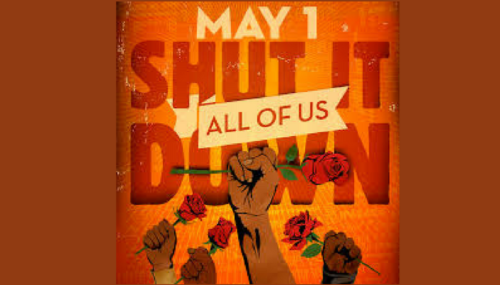 And on this May Day, we encourage others in labor to join us in focusing our organizing on building independent political power in state and local projects – to take up the question of a Path to Power. These are difficult time–nothing is given to us, never has been and never will be. But we have our will, our people, and a strategy. And as always in our history: We have a world to win!